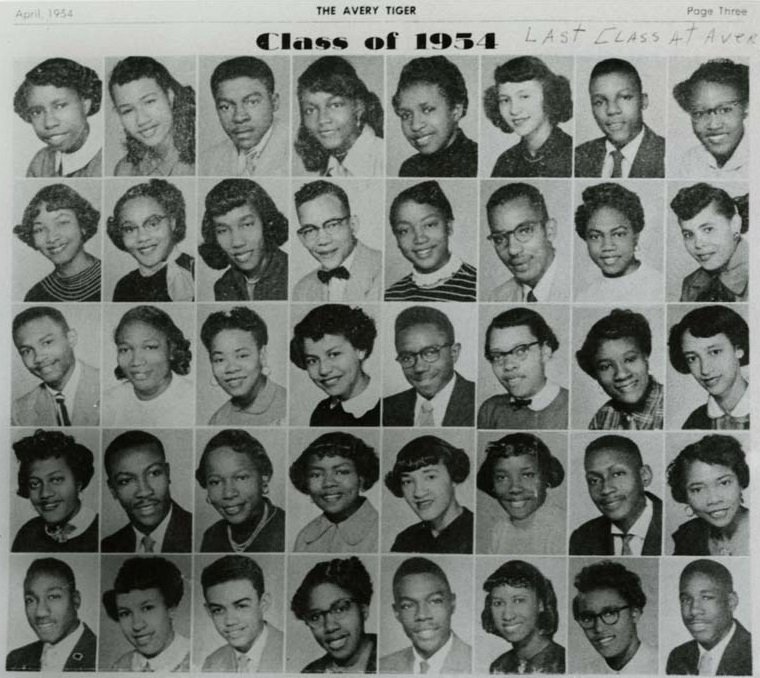 Avery's last graduating class, Charleston, South Carolina, April 1954, courtesy of AMISTAD, reprinted from the Avery Tiger. By 1944, American Missionary Association leaders had decided that they would no longer support secondary schools in the AMA system. Avery needed to become a public school funded by the City of Charleston. Averyites resisted this change because they feared that becoming a segregated public institution governed by the city would diminish the school’s legacy of academic excellence. Despite dedicated students, parents, and faculty, segregated Black public schools throughout South Carolina struggled with severe disparities in resources compared to the government support provided to white public schools. In the 1930s and 1940s, Avery was the only accredited Black high school in Charleston. Burke High School, the only public institution for Black students in the city at that time, did not qualify for full accreditation until the 1950s due to lack of government support. "Avery High School To Be Abandoned," the News and Courier, April 14, 1954, Charleston, South Carolina, courtesy of the Avery Research Center. Last known photo of Avery faculty, Charleston, South Carolina, ca. 1947, courtesy of the Avery Research Center. In response to campaigns led by Black activists, support for Black public education in South Carolina began to change in the late 1940s. The threat of intervention from the federal government convinced local authorities to make concessions for improving Black public schools. With this shift in resources, Avery’s Principal Potts successfully negotiated an agreement between the AMA home office and the city school board for the renamed Avery High School to operate as a public college preparatory high school starting in 1947. As a city-funded school, Avery would no longer charge tuition, which gave Black Charlestonians increased access to the prestigious school. Soon after Avery High School opened to Charleston’s Black community, however, the newly designated public school closed. 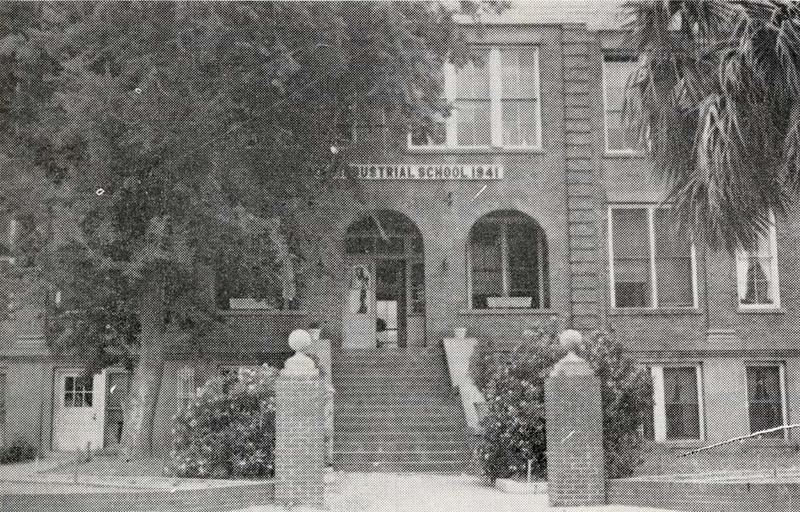 From 1948–49, the city school board commissioned a survey of Charleston’s public school facilities, which determined that the Avery building should be abandoned and the Burke High School building torn down and replaced with a new building. The city board voted in 1949 to build a larger facility for Burke and merge the two schools, but the merger was delayed until the completion of construction on the new building. In the meantime, South Carolina’s white leaders poured funds into a statewide “equalization” plan, in a belated attempt to improve Black schools throughout the state. 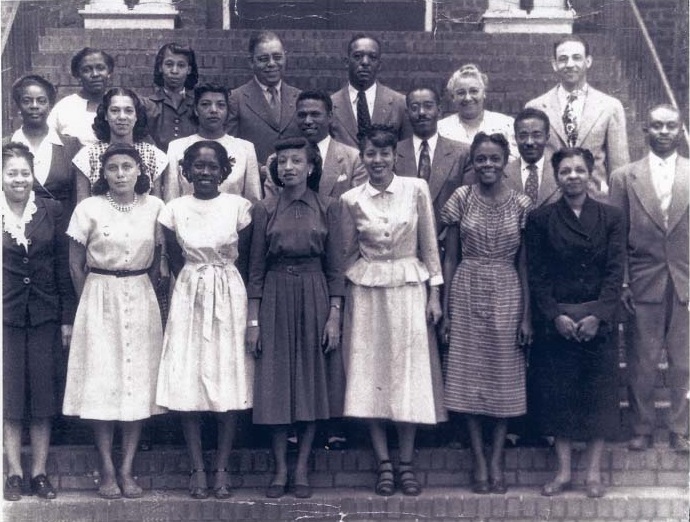 Their goal was to prevent school integration by proving that Black public schools could be “separate but equal.” Averyites hoped to secure funds to build a new school rather than merge with Burke, but in 1954, the same year that the U.S. Supreme Court ruled segregation unconstitutional in Brown v. Board of Education, the city board finalized its decision to close Avery. Burke High School building before merger with Avery High School, ca. 1940s, courtesy of the Avery Research Center. 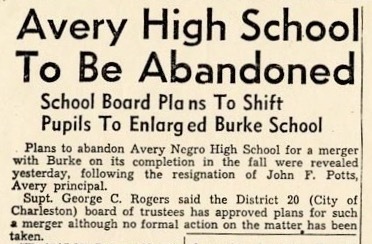 In 1949, the City of Charleston School Board voted to close Avery and merge the school with Burke High School, after the city built a larger facility for Burke. Once the new building was constructed in 1954, the schools officially merged.